Quick quiz: can you name the country whose wines get financial support from the U.S. State Department? If you said the United States of America, nice try. The U.S. government's idea of supporting its own country's wine is to keep the beer & wine distributors who heavily contribute to political campaigns happy. It's not like the European Union, where wine producers get all sorts of government support. No, the answer is a country that is in Europe, but not in the E.U., and therefore not able to balance its budget with money from Germany. It's Georgia: "the country, not the state," as you have to tell everyone whenever you talk about Georgian wine. Why is the U.S. government supporting Georgian wine? "Because they want Georgia to stay focused on the west instead of their big neighbor to the north," says Lisa Granik, an MW who presented a tasting of Georgian wines recently in San Francisco. Georgia's economy is a mess. Part of its territory is occupied by Russia, which cut off imports of its wines in 2006, leading to a financial crisis. Believe it or not, its number one export is now used cars. People are selling off whatever they have to feed themselves. But the wines that the Soviet Union deemed Georgia's most vital industry are still a potential strength. Georgia is in the triangle with Turkey and Armenia where vitis vinifera grapes were first domesticated. Unlike those two countries, it does not have a history of Muslim rule, so it has had uninterrupted wine production for 8000 years. However, until the 1800s, wine was something Georgians made only for their own consumption. Commercial wine production didn't develop until the Soviet era. Stalin was Georgian and he liked wine, and thus he allowed Georgia to keep its own grape varieties, of which it has more than 500. The workhorses are the white grape Rkatsiteli, the number one variety mainly for its productivity, and the red grape Saperavi. Georgia produces 15 million cases a year, which sounds like a lot from a country of 4.5 million people, but it's only about as much as Barefoot Cellars, and it's only about 60% of what it produced in the Soviet era. Natural wine lovers have been excited recently about wines made in qveri, aka amphora. Is this the traditional method of winemaking in Georgia? That word "traditional" is so fuzzy. Commercially, it is not: the Soviets were very serious about technological winemaking. Qveri were something people used themselves in their own backyards, but they didn't sell those wines. We only tasted eight Georgian wines in a sit-down setting. There were more at a trade walkaround, never ideal tasting conditions, but even less so for wines where one has so little experience. My notes from three different wines at the walkaround include "How did a cider get into this tasting? ", "Discomforting, I don't know how to react to it," and "Looks like a urine sample from a very sick person." But I did really like several wines (scores over 90 points, for those keeping score), and they aren't your grandma's cougar juice. These are true curiosities, yet they are available on the U.S. market, and they're surprisingly cheap. Hurray, you can buy this one! However, there's one big problem: I tasted several wines I really liked, from Nikoladzeebis Marani and Archil Guniava and Kindzmarauli Marani, that I either can't find online or can't be sure whether they're the same. In fact, I wrote the top part of this post, intending to recommend seven wines, and then I had to take them out of the post one by one. If I limited my recommendations to only wines that I actually tasted -- including same vintage -- well, I'm down to one $11 wine. I wouldn't have run this post at all but what the hell, I'm trying to do my part for U.S. foreign policy. No matter what Fox News tells you, not all Democrats are "with the terrorists." John Kerry, you've got your work cut out for you. This full-flavored wine opens with apple and apricot, then finishes with intense minerality. 12.5% alcohol. I could only find the 2012 online (linked above) and I don't know how it ages, but it's only $14 so it's not too expensive to find out. 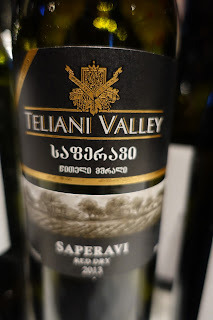 Teliani Valley is one of the better organized Georgia wineries so its wines are more consistently available in the U.S. This is an iron-rich, meaty, dark red fruit wine that would be wonderful with steak tartare. 13% alcohol. And holy crap, that's a lot of interesting wine for $10.99. Click on the name to buy it. I'm not sure what your grandma drinks but my grandma's "cougar juice" is a gin martini, with equal measures of sunlight and vermouth. Hello, thank you for covering Georgian wines. For US consumers interested in Georgian wines, we have recently launched interactive online map, where users can add stores which carry quality Georgian wines. View Hvino Map: http://map.hvino.com. Thanks for the coverage, Blake! Incidentally, the Germans also are investing in the Georgian wine industry. And the Americans are also supporting Moldova, via USAID, as well as other countries, I suspect. As for the wines you liked, the importer/distributor information was in the tasting booklet for that day - they should know where their wines are available in the different markets. Yea, Blue Danube brings in some great wines. Didn't know they were doing some from Georgia, but doesn't surprise me much since that's their vaguely general geographical specialty in that area. Thanks for writing the post. I am very excited since I got to pour you a lot of those wines. 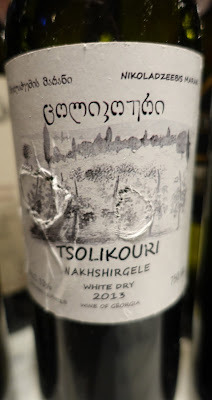 Georgian Wine House has been importing Georgian wines since 2005 starting with Teliani Valley and inclu ding a portfolio of 8 Georgian Brands. We are so excited you loved the Teliani Valley Saperavi and the Schuchmann Rkatsiteli. I wanted to let you know that in fact our whole portfolio of Georgian wine is available for purchase online at Potomac Wines and Spirits and can be shipped most everywhere in the US. We also have distribution of our wines in 8 markets, (you can see where to buy Georgian wine here) Blue Danube currently distributing our wines in CA but will stop in 2016 when they start bringing their own brands. Chris Terrell imports the Tsolikouri you liked so you may want to reach out to him to see where you can get it. You can see our full Georgian wine portfolio and where to buy them. In case there were any others in your list that you couldn't find on Wine-snooth let us know and we can help you find where to buy them.